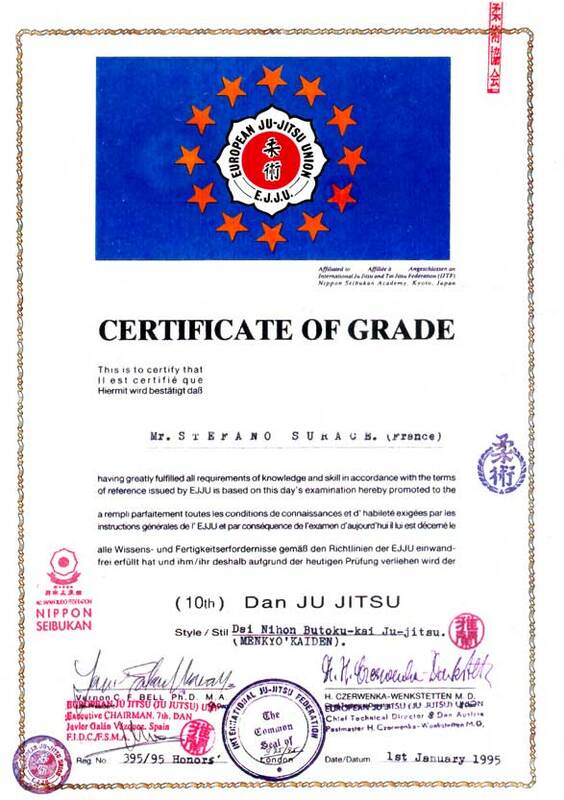 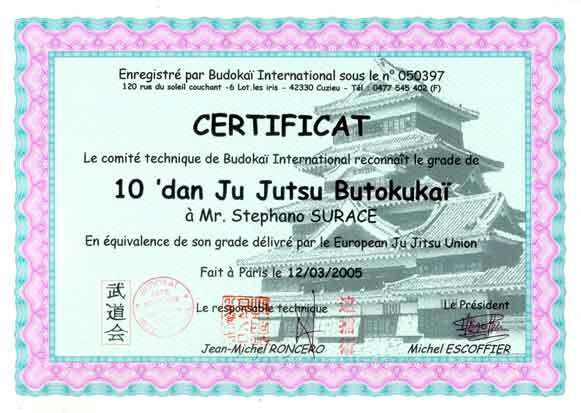 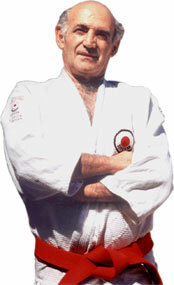 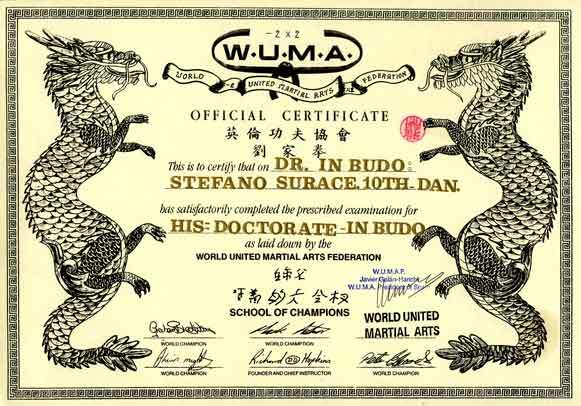 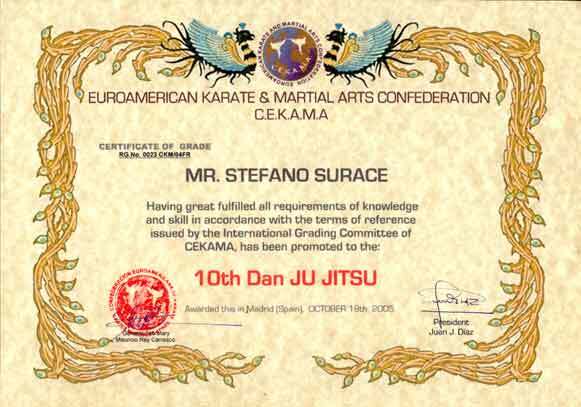 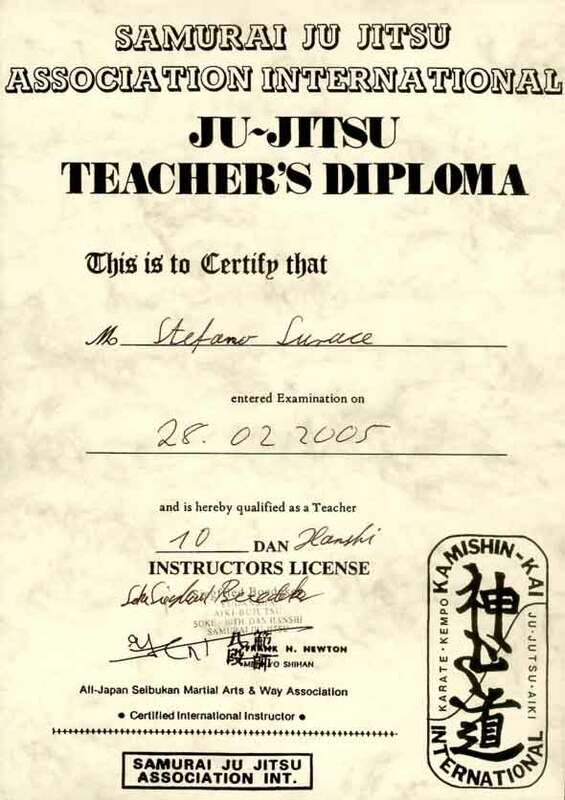 Master Stefano Surace sensei holds the highest official Ju Jitsu grade in the world, recognized in Japan: 10th dan Menkyo-Kaiden, member of Nippon Seibukan. 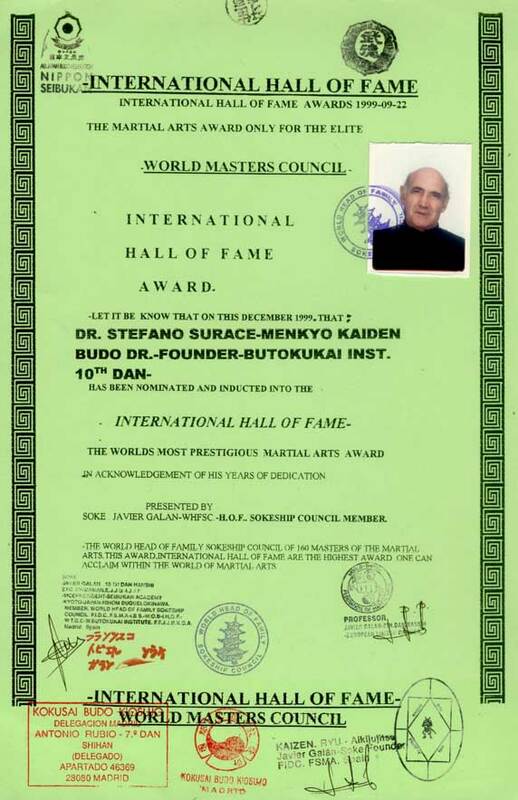 Seibukan is the official japanese Academy of Martial Arts, the most important worldwide Budo institution, the only one recognized by UNESCO. 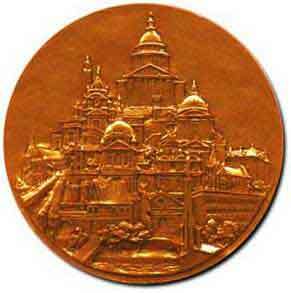 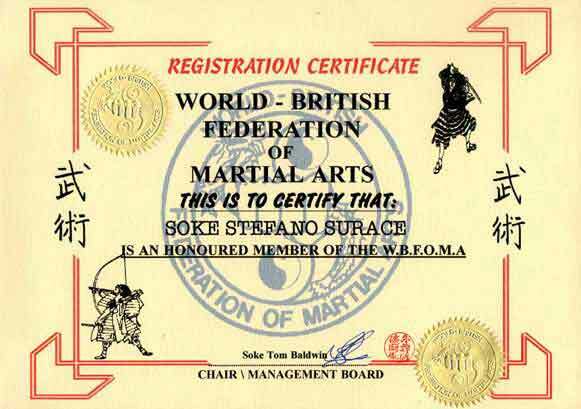 - Member of honor with life of British Art Martial Federation. 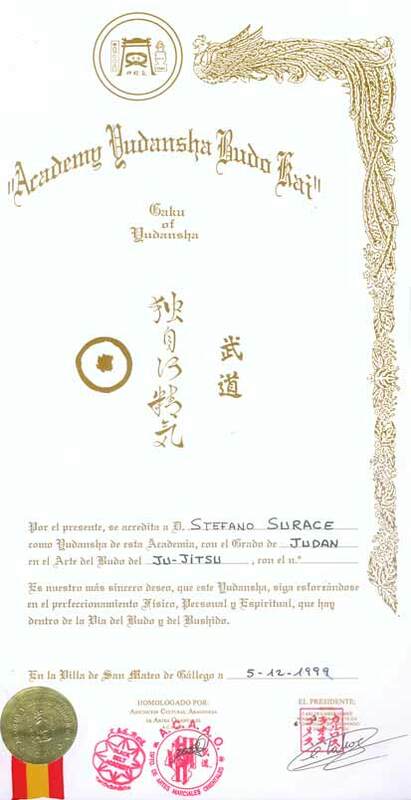 Seibukan officially expressed to him its own recognition for its work to the training of young people. 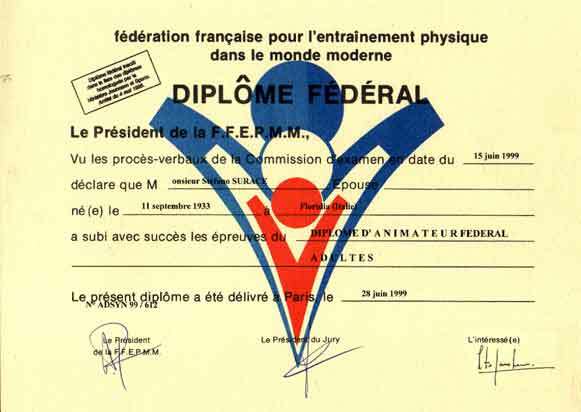 Jacques Chirac, President of the French Republic decorated him for his merits of journalist, of teacher of the young people and of creator of champions. 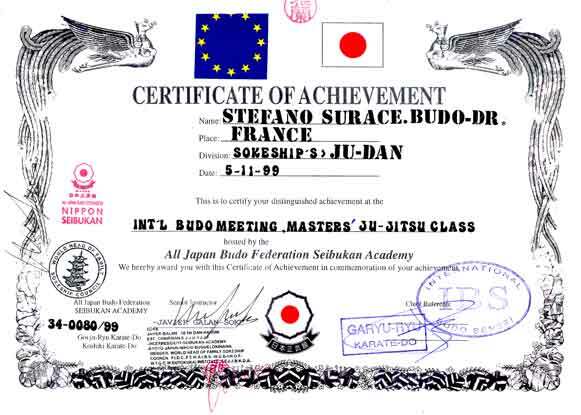 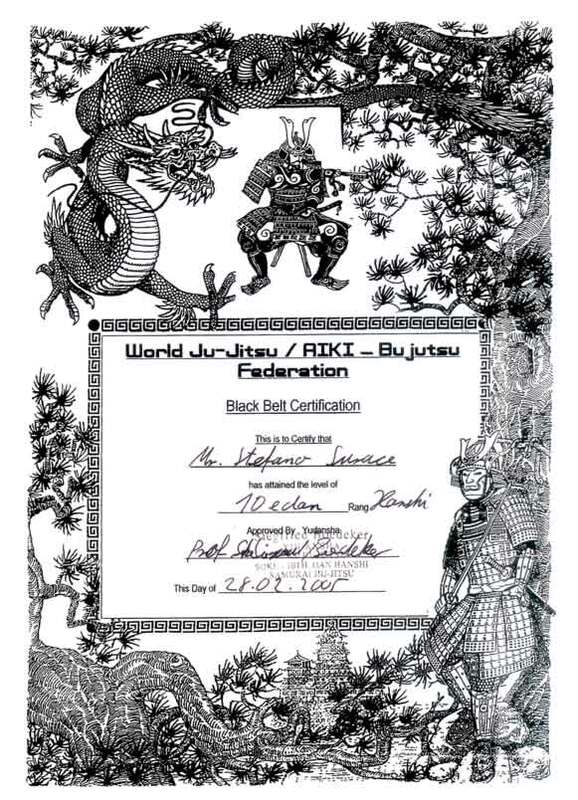 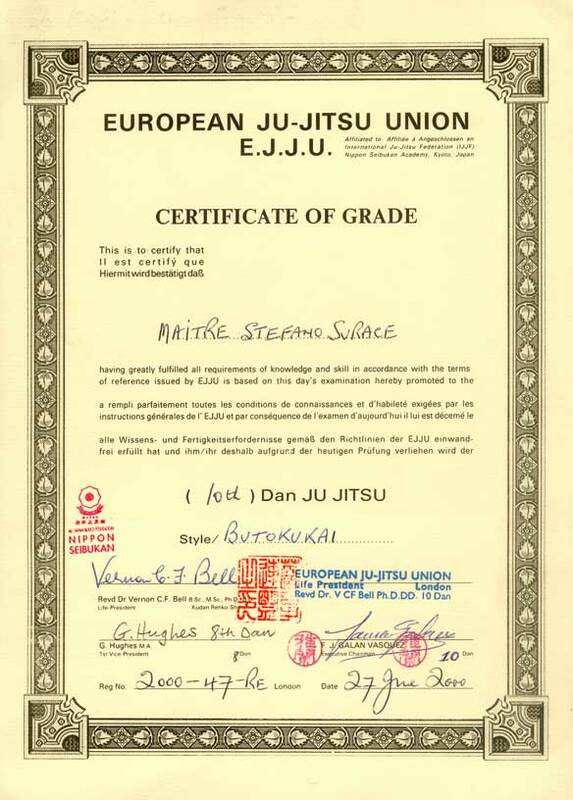 Four of its pupils gained the World Cup of Ju Jitsu (free fights without categories of weight) in 1993, 1994, 1997, 2004 : Nicourt, Grillot, Stoppa, Perier. 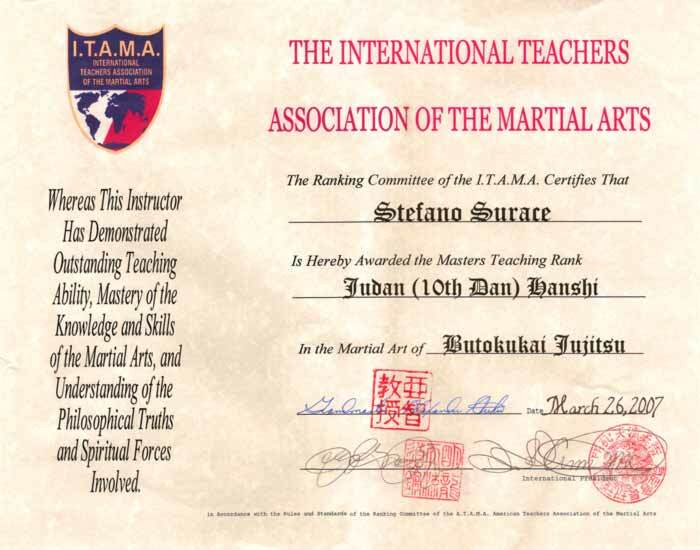 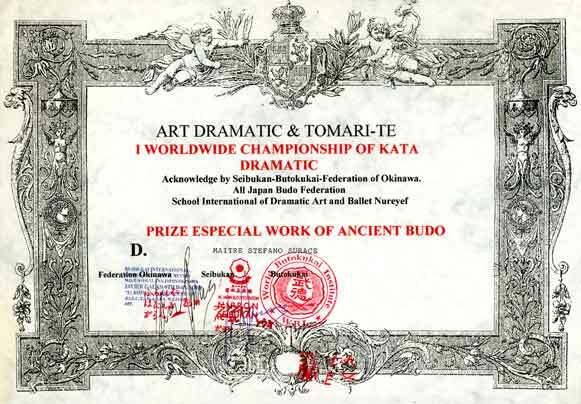 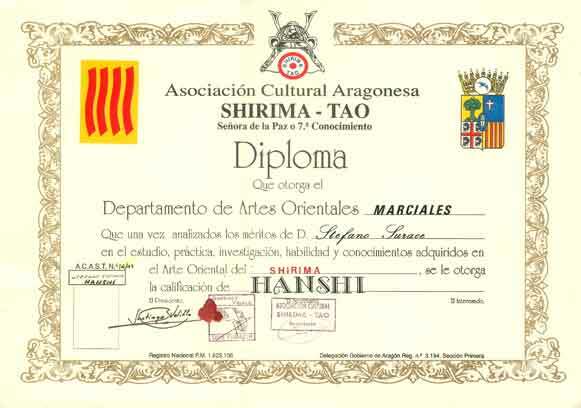 This is the first time that the highest official graduate of a japanese martial art is not a Japanese but an Occidental. 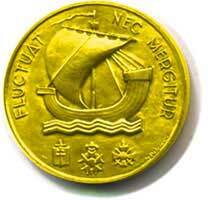 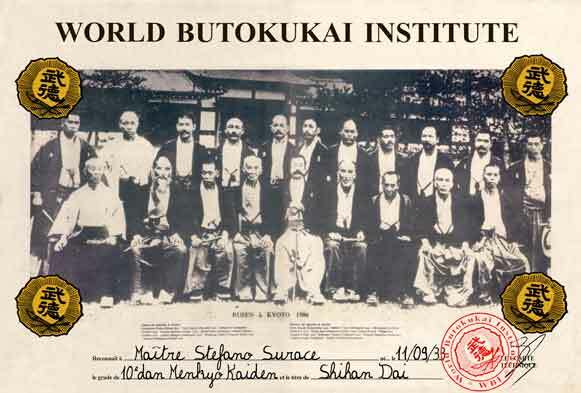 The Dai Nippon Butokukai was the Imperial Martial Virtue Association until the end of WW2. 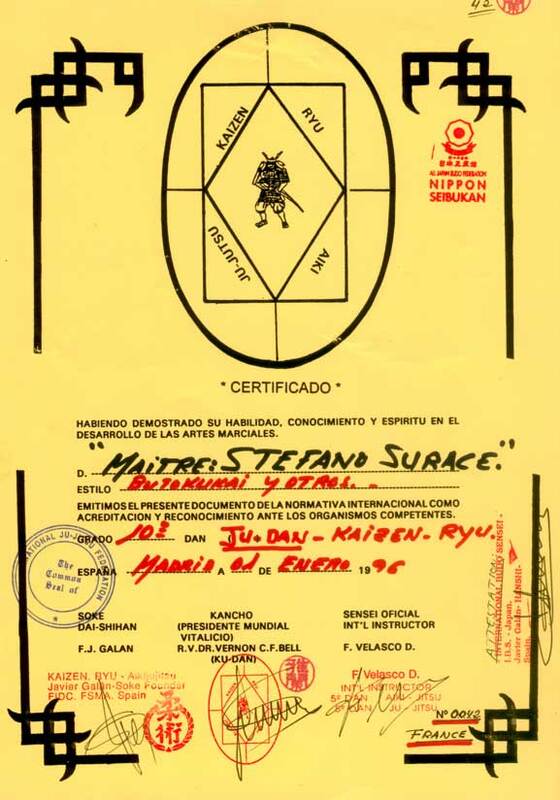 The best masters of the 11 most important Ju Jitsu schools were brought together there and were in charge of elaborating a synthesis of the most efficient techniques of each school. 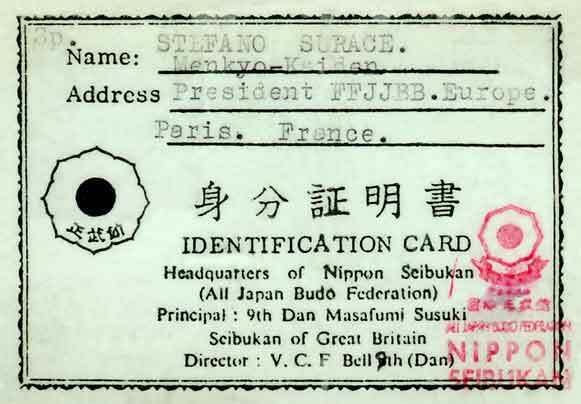 Particularly rational and structured, this «supreme method» was only taught to a selected élite which refused to ensure its diffusion after 1945, for the sake of coherence with its Japanese traditional ethics. 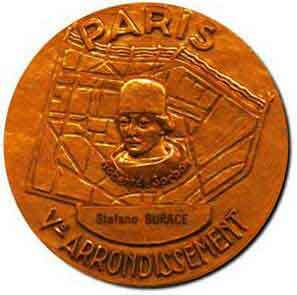 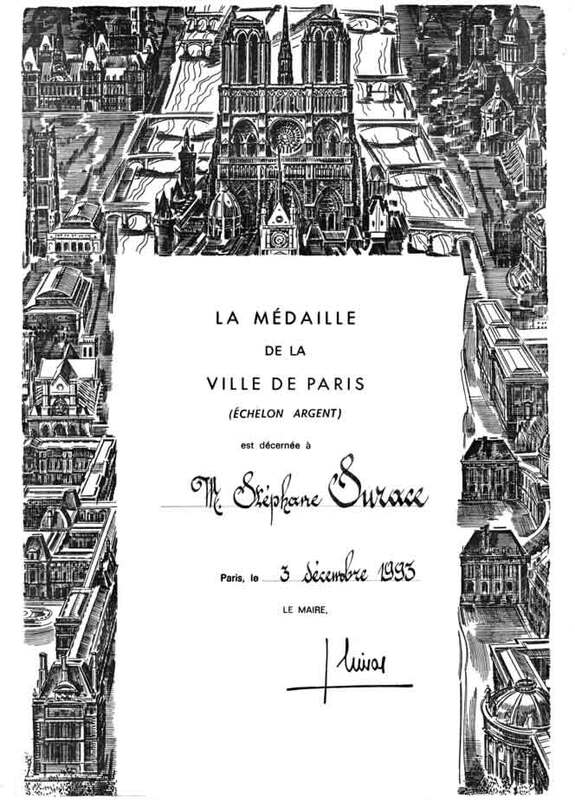 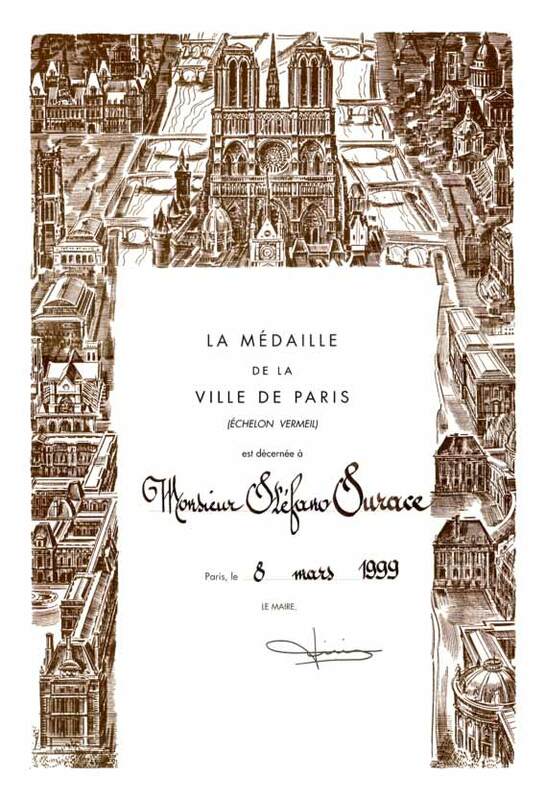 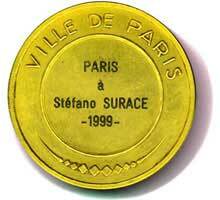 By an exceptional combination of circumstances detailed in Surace's book (available in French) « La plume et la main vide» , the last holder of this method is now Stefano Surace. 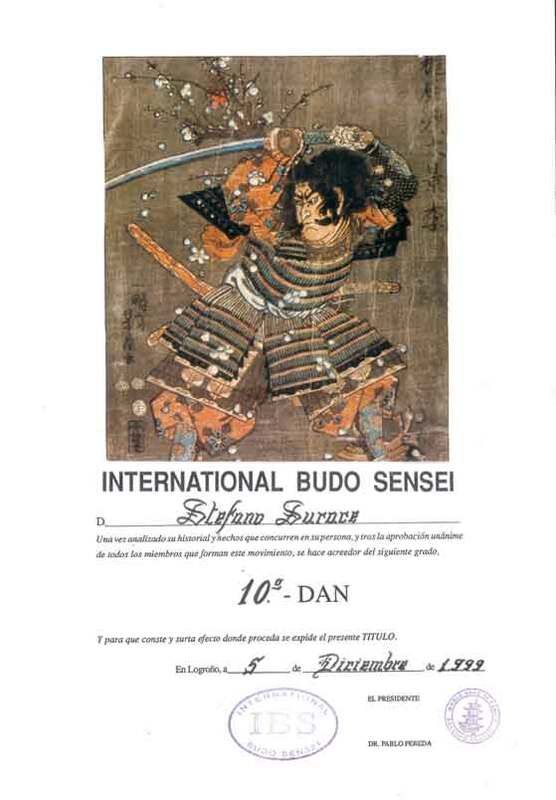 This famous Italian journalist has decided to start teaching in order to preserve his knowledge and keep it as part of the universal patrimony.